As the community group are working on the community plan, we were pleased by the opportunity to attend the consultation event with our own boards. We talked to many residents and will try to add everything we heard to our plan to give feedback to the City Council about what the community wants. The main topics raised with me on the day were ‘a safer crossing for Worthy Road is needed’, and ‘the houses to be built at Hillier Road being unsuitable for the area and boxing in the people living at Simonds Court’. We were also complimented on what we do as a community group and on our web presence which people seem to really like. Of course we also wanted to take a look ourselves at what the Council and the Scouts presented. I hadn’t been aware that there would also be people from the football club with a plan of their own about what they want to do with the club buildings. At the consultation some people seemed to have trouble to find somebody from the Council to talk to, and I agree officers at times weren’t easy to spot as not all of them seemed to have lanyards with identification tags, so residents came over to me to make their points, with them apparently thinking I was Council officer (despite a home-made name tag). Of course we are also interested in what people think about housing developments, so after pointing out that I was from the community group I happily listened to what they had to say. I had been there for two hours first thing, speaking with residents about various items but didn’t really have a chance to look at everything presented in detail then as the marquee was quite full. Apparently there were about 150 people visiting in total. When I had to leave, Brenda and Keith helped out (thank you!) representing the group, and later our chair Lynne took over. When I joined Lynne later in the day to tidy up, we agreed we were a bit confused by one of the boards presented by the council re landscape improvements. Once again sticky dots were used to collect feedback on what people would like to happen (a practice that was used at the consultation event in 2012 and which we heavily criticised at the time as there was nobody watching at that event how many dots residents actually used), and while there was more control this time on how many dots people were allowed to use, the options presented were grouped and if you opted for one of those things in a group your dot then was also indicating support for all of the other things in there which is not necessarily what was meant. From talking with people I have learnt that many are happy with our green areas as they are and don’t really want much to be done to them. 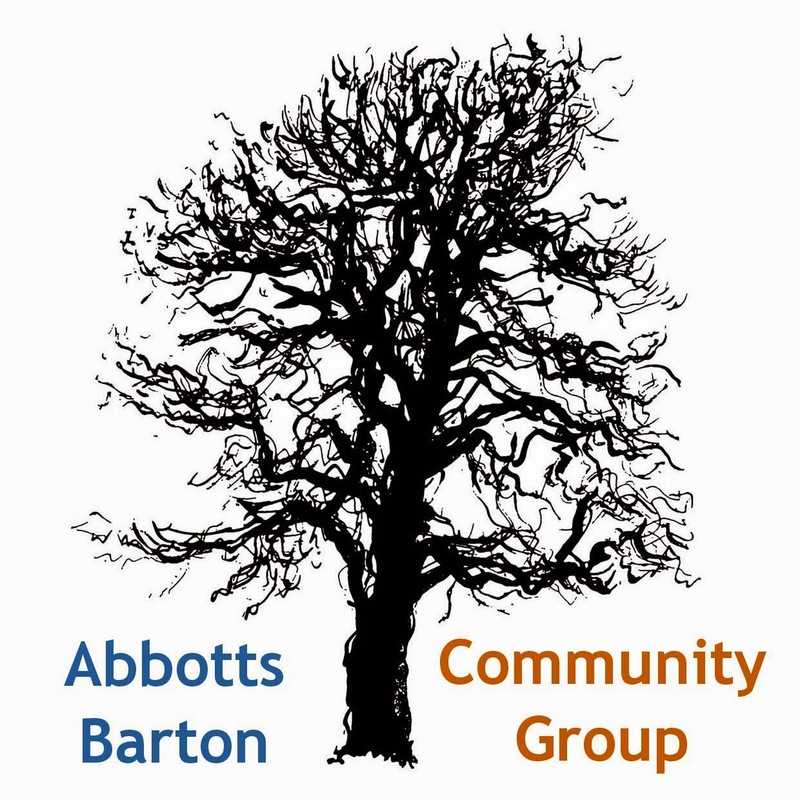 From what I’ve heard, people are in general not very keen on any houses being built in the free spaces in Abbotts Barton. A sentiment that I share because I love that there is so much green space, but I do recognise the need for more council houses as there are so many people on the waiting list. 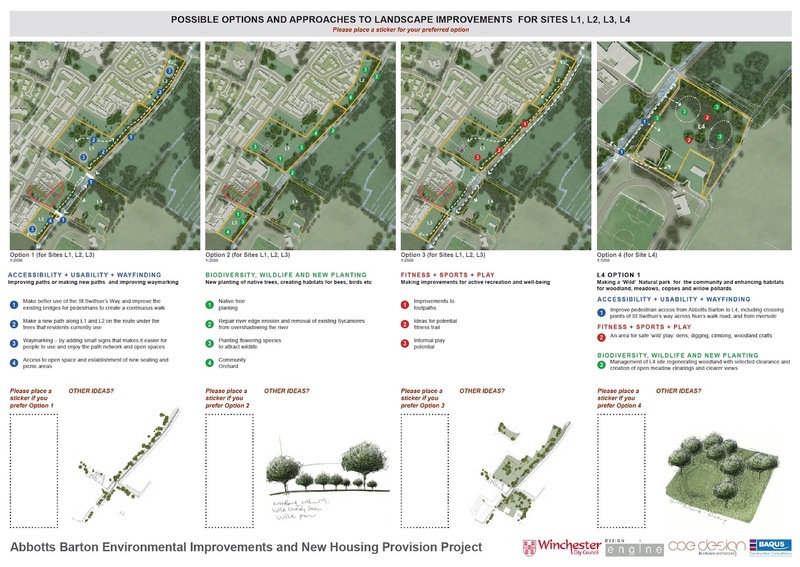 A lot of residents seem to agree that the main area to keep free of houses is the top of the main park along Chaundler Road/Charles Close - which we were told in a briefing in September 2014 would stay free (‘council listening to residents’), but some residents really don’t want any new houses at all on any of the green areas. 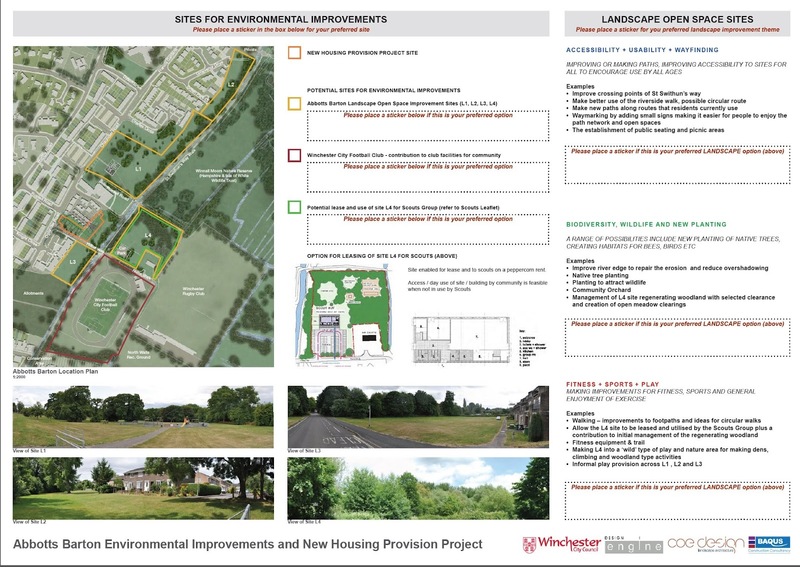 Residents also fear that once houses are built in those areas marked for development, more will be added in places that are currently not marked for houses. The feedback to our community plan as seen so far is interesting but we are hoping to get many more responses, that’s why we have put together an online version of our questionnaire. Please let us have your thoughts, also about the housing and the consultation! It only takes five minutes! Hi there - thank you very much for this thorough update. I could not be at the consultation, as I work in London. I complained to the Council in 2011 about their apparent belief that running a single meeting on a weekday in working hours constituted meaningful consultation: I may have missed it in other correspondence, but do you know if there is another way I can see the detail of what they are proposing and comment? The sticky dots exercise sounds a ridiculous way to canvass views fairly - reminiscent of their "consultation" over the proposed expansion of River Park. Thank you to you all for investing your time and energy at Tuesday's meeting, and for sharing this update. Thank you for your kind message! I would have preferred to answer by email but this comments system doesn't seem to allow this as I couldn't find your email address anywhere. Did you fill out one of our questionnaires yet? 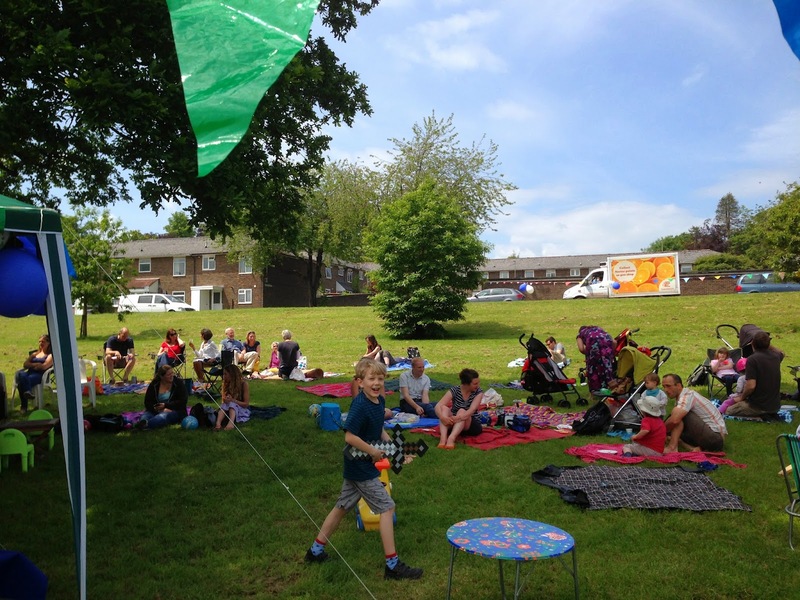 We would really value any kind of feedback on what you think should be in a community plan but also whatever other comments you would like to give about the consultation, so that we can feed this back to the Council too (without personal details of course)!